There is no surprise to learn that coming away from the Malaysian Grand Prix, a number of questions are being asked - with Ferrari the inevitable target. We look at the two of the loudest. How could Ferrari know to use intermediate tyres? 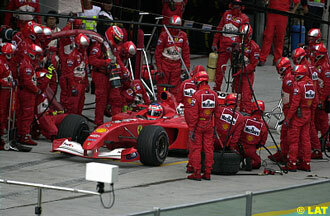 When the rain came, the Ferrari drivers were the first to feel the influence as they spun off the track together. Whilst not the first into the pits, they certainly came in amid a flood of others, who all looked for full wet tyres to continue. Conditions were so bad that five drivers had already spun out, beaching their cars, let alone the number who had fallen off the circuit, but tip-toed around to the pits for wets. Even with full wet tyres, race leader David Coulthard was struggling to stay on the surface, despite a clear view of the road and standing water ahead from his vantage point behind the safety car: he was aquaplaning at 60mph, which in Formula One terms is a serious impediment to racing. Yet both Ferrari returned their drivers to the track with intermediate tyres, watched the safety car bring the race to them, then maximised the advantage to score a powerful one-two. Detractors from the sport believe Ferrari to be in cahoots with the race stewards, and put the long pit-stop down to them taking the time to confirm the safety car would remain out, thereby enabling Ferrari to leverage information available to no other team. The more balanced view is that Ferrari simply gambled on their weather prediction, and won. Had the rain continued much longer, the race would have been stopped and restarted. If it stopped as predicted, then the safety car period would start to clear the track, but more to the point, their wet-shod rivals would lift water from the surface at a serious rate on restarting, so intermediates would soon be quicker than full wets. Either way, nothing to lose, but big potential to gain. As for influencing the actions of the safety car, it has to be said a number of Michelin technicians - who are proud of their wet weather tyre, believing it significantly better than the Bridgestone offering - are also wondering why they bother to bring wet weather tyres at all. If the FIA is to bring out the safety car every time there is standing water on the track, then they can save a heap on haulage expense and not bring two of the three sets of wet-weather tyres to the events. But they don't think Ferrari had much influence this time: Coulthard's complaints of aquaplaning at 60mph apparently swayed Charlie Whiting into keeping the Safety Car out so long, so Michelin think it is McLaren who have something to answer for there! For the second race in succession Rubens Barrichello pushed another car off the circuit in order to pass it - and again, claims no responsibility for the action. Ralf Schumacher was diplomatic to the media afterwards, claiming he would have to see the event on television before commenting, but that is certainly not what he said to his engineers - suffice to say he was remarkably controlled, considering a demotion to dead last. 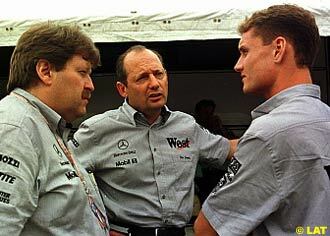 But, as Eddie Irvine said: "What annoys me is that Zonta did it to Michael last year, and got a big penalty. Rubens did it to Heinz-Harald at the last race, and Ralf today. It is frustrating when nothing's done about it. When it happens to Michael, something gets done. When it happens to me, or anyone else, nothing gets done." It is a good question: Ricardo Zonta's incident last year happened when Schumacher braked early for the first corner, keeping an eye out for his charging teammate. Zonta was caught unaware, and clipped the German into the gravel trap. Now, Barrichello drove - again - into the back of an opponent, and has not even received a reprimand, despite mutterings from the FIA that they were directing stewards to ensure "all contact is investigated properly, and in a timely fashion." At the end of the day, there is nothing concrete. But the accumulation of "favouritism" only fuels the fires of the conspiracy theorists. Following Ross Brawn's defence of Ferrari's tyre choice in Sepang, Ron Dennis is concerned that Bridgestone is not playing with an open deck of cards. When denying Ron Dennis's accusation concerning risking the lives of their drivers, Brawn stated "we tried those tyres at Fiorano last week, and we knew that the intermediate was a very, very good tyre. Even in fairly deep water. So I think that's an unfortunate comment for him to make without the facts or information that was needed." On the face of it, the comment appeared to be innocent; however, it has led a number of McLaren test personnel to be wondering why Ferrari have data that they do not. After all, when McLaren jumped from Goodyear to Bridgestone, the agreement secured a favourable working relationship with the tyre manufacturer. When Ferrari finally changed to Bridgestone, a lot of political wrangling behind the scenes, including supply of tyres to road-cars, and a lot more besides, ensured Ferrari at least the same level of support from Bridgestone. Officially, it was disguised (badly) by the manufacturer to allay fears of favouritism from the other teams. An announcement that Bridgestone was working with the "top two teams in the Championship" to produce rubber for the next year did the trick. But now McLaren are looking at their partner in a new light. At the Japanese Grand Prix last year, Bridgestone decided to bring only one dry weather tyre to the race, claiming that three sets of wets would be required, as the race was likely to be wet, and the slicks were the best bet anyway. Actually, it quickly became apparent to McLaren that the tyre was not the best for them, being harder than the one they would have chosen - but it suited Ferrari rather nicely. Ferrari sealed the Championship, and McLaren acted like good losers. In public, at least. But privately, strong questions were posed to Bridgestone, and unsatisfactory answers were given. In winter testing, McLaren put thousands of miles on Bridgestone rubber, in preparation for the Michelin challenge. In theory, they were working with a partner, in order to develop the most competitive result. However, the feedback given to Bridgestone did not always lead to the Japanese giant taking the expected development path - due largely, the test team believed, to the requirements from Ferrari contradicting their own. In fairness, McLaren admit that Ferrari have an excellent mechanical design, with an edge on their own setup. Over winter, their Italian competitors have worked hard with Bridgestone too, and inevitably there must be an element of compromise that Bridgestone make between the two top teams. They just don't understand how Ferrari are suddenly getting the absolute maximum from their tyres - and know so much about "new" constructs, like the intermediate released a fortnight ago - when that type of expertise fell within their own domain for the last few years.